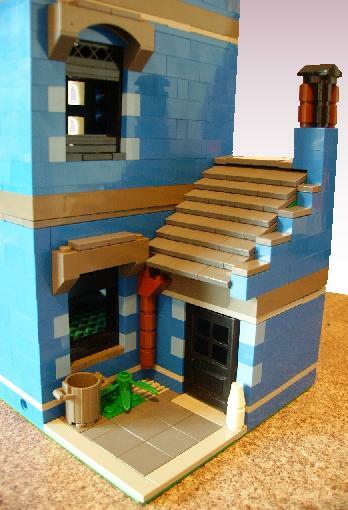 Brick Town Talk: Design Features - LEGO Town, Architecture, Building Tips, Inspiration Ideas, and more! 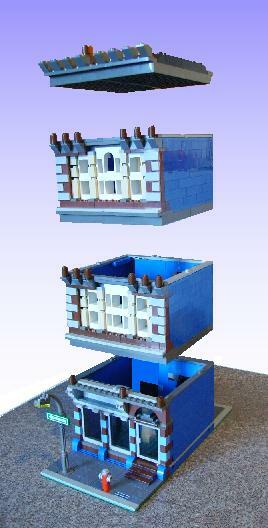 I have used the Old Grey 8 x 16 Bricks from Harry Potter sets to make the floor/ceiling for each level. Like Cafe Corner, the walls are topped off with 1 x 8 Tiles, therefore the different levels can separate easily. I have used a Green 16 x 32 Baseplate in keeping with the Cafe Corner Baseplates and included 1 x 2 Technic Bricks with One Hole in order to connect this model to the Cafe Corner in the correct places. The upper windows have been made with panels as it was difficult to scale the windows any other way. I have tried something new (to me) with the small roof in the backyard. It is made up of Tiles rather than Slopes.